Musical Farce Pulls Out All the Stops at Jean’s Playhouse! Lincoln-Woodstock’s Playhouse Players are at it again! 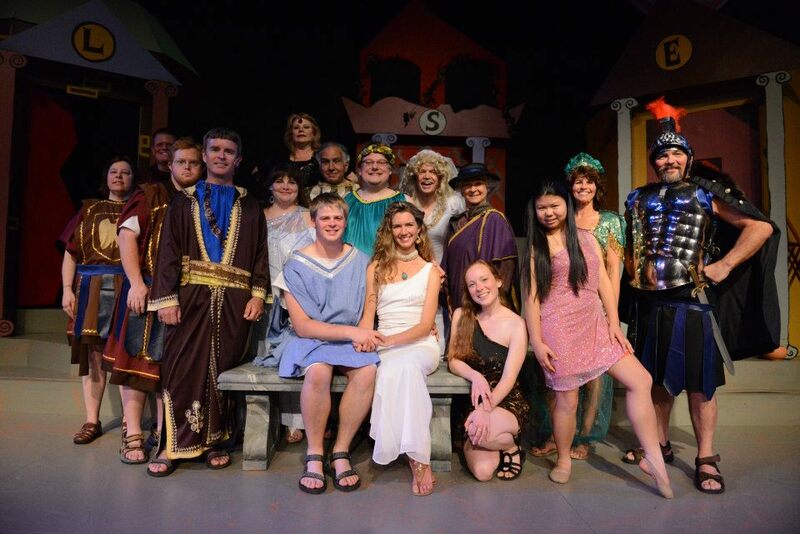 The bawdy musical, A Funny Thing Happened on the Way to the Forum, will be opening at Jean’s Playhouse in Lincoln on Saturday, May 11th at 7:30 pm. On Sunday, May 12th, a special Mother’s Day brunch-and-show package will allow theater-goers to purchase a $15.00 brunch at the Woodstock Station before the show at 2:00 pm (please bring tickets to the Station for discount)! The show will also run the following weekend, on Saturday, May 18th at 7:30 pm and Sunday, May 19th at 2:00 pm. Forum, set in Roman times, tells the story of Pseudolus, a slave who must obey his domineering mistress, his master (“That Dirty Old Man”, one of the show’s musical numbers, will tell you all you need to know about him), and their idealistic son named (appropriately) Hero. Pseudolus yearns to be free- until, one day, his young master agrees to grant him his freedom in exchange for the girl of his dreams (who just happens to be the young virgin in a house of courtesans living next door!). Come and enjoy an evening of musical farce full of togas, dancing girls, mishaps, chases, disguises… and hilarity! Next up at Jean’s Playhouse will be Seussical Jr, performing June 1st and 2nd. This is the debut performance of Jean’s Teens, a community group featuring performers between the ages of 12 and 19, and a show to be enjoyed by children of all ages! For a complete schedule of spring shows at Jean’s Playhouse, as well as the professional theater season starting May 31st, visit www.papermilltheatre.org. Tickets to Forum are $20 for Adults and $15 for Seniors and Students and may be purchased online or by calling 603-745-2141.